Groundwater details | What's so bad about gas? One of the largest artesian groundwater basins in the world is the Great Artesian Basin (GAB). It’s estimated to be about 1.7 million km2 and stores nearly 65 million megalitres of water. The basin is up to 3000m deep in some locations. Ground water is held in a layer of permeable sandstone, known as an aquifer. Impermeable sedimentary rock overlays the aquifer which traps water in the sandstone. The image below shows a ‘generic’ cross-section of the GAB, with multiple aquifers. Water moves really slowly in the aquifers – about one to five metres per year. Geologists and scientists have tried to estimate the age of water in the GAB through a combination of hydraulic modelling and chemistry. Depending on the location within the GAB, it’s estimated that water has been in the aquifer for up to 2 million years. Clearly the mechanisms at play operate on a long-term scale! Water leaves aquifers through natural springs or artificial bores. 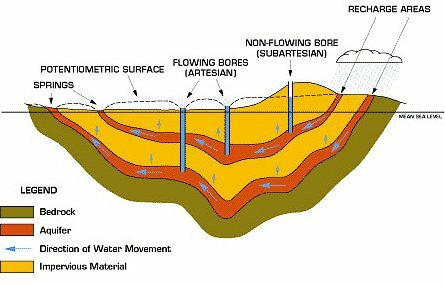 Because the aquifer is under pressure, water flows upward when a bore is created. In some situations, the water will rise above ground level, other times it has to be artificially pumped. So how does this fit in with coal seam gas extraction? There are a number of groundwater areas within Queensland, which often have multiple aquifers at the same location (at different depths, like the diagram above). The bore water used by agriculture is usually taken from aquifers close to the surface. Coal seam aquifers tend to be much deeper, about 300 to 600m underground. If these aquifers are in the same location, the mining companies will need to bore through the upper aquifer (accessed by farmers) to reach the coal. The coal seam gas well is enclosed in casing to prevent leakage into the upper aquifer. Many people are concerned about connectivity between the different aquifers which might result in contamination of the upper aquifer, or even loss of pressure at agricultural bores. The Queensland government has put in place mechanisms which aim to address these issues but I’m afraid that discussion will have to wait for a future blog post!